The residential photovoltaic (PV) market has expanded rapidly over the past decade, but questions exist about how equitably that growth has occurred across income groups. Prior studies have investigated this question but are often limited by narrow geographic study regions, now-dated analysis timeframes, or coarse estimates of PV-adopter incomes. At the same time, a spate of new programs and initiatives, as well as innovations in business models and product design, have emerged in recent years with the aim of making solar more accessible and affordable to broader segments of the population. Yet, many of those efforts are proceeding without robust underlying information about the income characteristics of recent residential PV adopters. This work aims to establish basic factual information about income trends among U.S. residential solar adopters, with some emphasis on low- and moderate-income (LMI) households. The analysis is unique in its relatively extensive coverage of the U.S. solar market, relying on Berkeley Lab’s Tracking the Sun dataset, which contains project-level data for the vast majority of all residential PV systems in the country (a subset of which are ultimately included in the analysis sample). This analysis is also unique in its use of household-level income estimates that provide a more-precise characterization of PV-adopter incomes than in most prior studies. The residential photovoltaic (PV) market has expanded rapidly over the past decade, but questions exist about how equitably that growth has occurred across income groups. Prior studies have investigated this question, but are often limited by narrow geographic study regions, now-dated analysis timeframes, or coarse estimates of PV-adopter incomes. At the same time, a spate of new programs and initiatives, as well as innovations in business models and product design, have emerged in recent years with the aim of making solar more accessible and affordable to broader segments of the population. Yet, many of those efforts are proceeding without robust underlying information about the income characteristics of recent residential PV adopters. This work aims to establish basic factual information about income trends among U.S. residential solar adopters, with some emphasis on low- and moderate-income (LMI) households. The analysis is unique in its relatively extensive coverage of the U.S. solar market, relying on Berkeley Lab’s Tracking the Sun dataset, which contains project-level data for the vast majority of all residential PV systems in the country (a subset of which are ultimately included in the analysis sample). This analysis is also unique in its use of household-level income estimates that provide a more-precise characterization of PV-adopter incomes than in most prior studies. 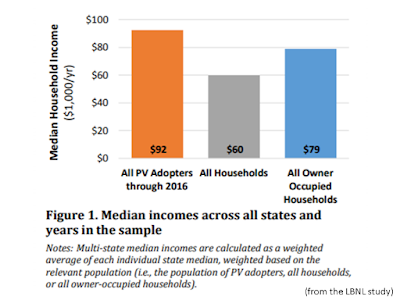 We describe income trends of residential PV adopters using several different metrics and methods, beginning first with a comparison of median incomes between PV adopters and other households (HHs). 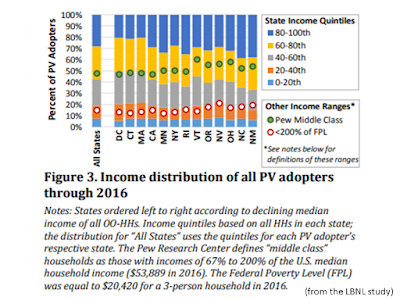 We then describe the overall income distribution of PV adopters relative to the income distribution of the broader population in each state, and present trends relying on several commonly used national income benchmarks for low-income and middle-class households. 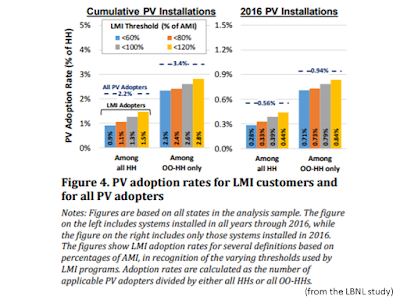 Finally, we compare PV adoption rates for LMI HHs to overall adoption rates in each state, and also compare PV system characteristics between LMI and non-LMI adopters. Following the convention used in many LMI-oriented programs, we classify HHs as LMI based on their income relative to the Area Median Income (AMI). The AMI is defined for each Metropolitan Statistical Area (MSA) or, in the case of rural areas, for each county. Adoption rates are calculated as the number of PV adopters divided by the number of applicable HHs in a given region. 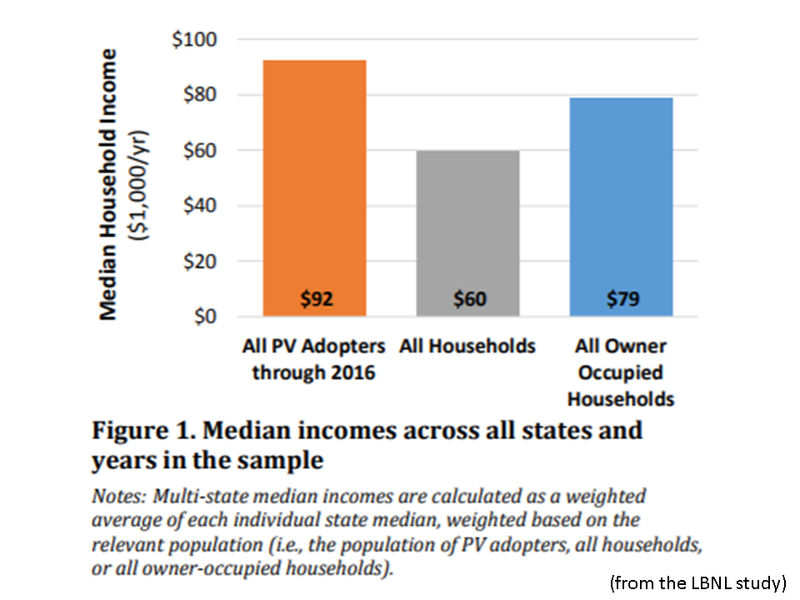 The median income of PV adopters is notably higher than other households, but the differences are much smaller when compared to just owner-occupied households. In aggregate across all states and years in our sample, the median income of PV adopters is $32k higher than for all HHs ($92k vs. $60k), as shown in Figure 1. Among each of the 13 individual states in the sample, PV-adopter median incomes are also consistently higher (typically by $20-$30k) than the statewide medians for all HHs; those comparisons are presented in the full report. Much of the disparity in median incomes relative to all HHs can be attributed to home ownership, as residential rooftop PV adopters are effectively all homeowners, which tend to have relatively high incomes compared to the population at large. When comparing to just owner-occupied households (OOHHs), the median income of all PV adopters in the sample is still higher, though by a significantly smaller margin ($13k). Across individual states, the disparity between PV-adopter median incomes and all OO-HHs varies considerably, with the greatest gaps in states with low income levels overall and smaller gaps in states with high incomes (see full report for supporting figure). In fact, in the three highest-income states in the sample (CT, DC, and MA), the relationship is inverted, with PV-adopter median incomes that are actually lower than the median for all OO-HHs. This occurs for the simple reason that in higher income states, a larger fraction of HHs below the median can afford PV. PV adoption has been trending towards more moderate income HHs in recent years. Prior to 2010, PV adoption became increasingly skewed over time toward higher income HHs. However, since 2010, adoption has steadily trended in the opposite direction, toward more-moderate income HHs. This is evident in Figure 2, which shows median incomes for PV adopters declining from $100k in 2010 (27% above all OO-HHs) to $87k in 2016 (10% above all OO-HHs). The same set of trends are exhibited in most individual states as well. By 2016, the four highest-income states (CA, CT, DC, and MA) had reached “income parity”, with median incomes of PV adopters in that year equal to or below the median for all OO-HHs. This general trend in PV adoption toward more-moderate income HHs likely reflects a combination of factors: continued PV cost declines, the growth of third-party ownership, recent efforts by public agencies and solar firms to specifically target LMI customers, and a general maturing of solar markets with greater consumer awareness and a larger number of firms seeking to expand their customer base. Even if under-represented, “moderate-income” households nevertheless constitute a sizeable share of PV adopters. No standard definition exists for “moderate income”. As one measure, Figure 3 shows that 43% of all PV adopters in the analysis sample fall within the bottom three income quintiles (i.e., the 60% of HHs, including both home-owners and renters, with the lowest incomes in each state). Within each of the 13 individual states, the share of adopters in the bottom three income quintiles ranges from 33%-50%, and consistent with the previously noted trend, those percentages have generally been rising over time. Another relevant benchmark is Pew Research Center’s definition of “middle class”, consisting of HHs with incomes ranging from 67%-200% of the U.S. median. Among all PV adopters in our sample, 48% fall within that range (47%-60% across individual states). Even low-income groups are seemingly represented, with 15% of all PV adopters in the sample below 200% of the Federal Poverty Level (FPL), a common benchmark used in low-income programs. Note, though, that some questions exist about the accuracy of the PV-adopter income estimates at the lowest end of the spectrum, as discussed further in the full report. 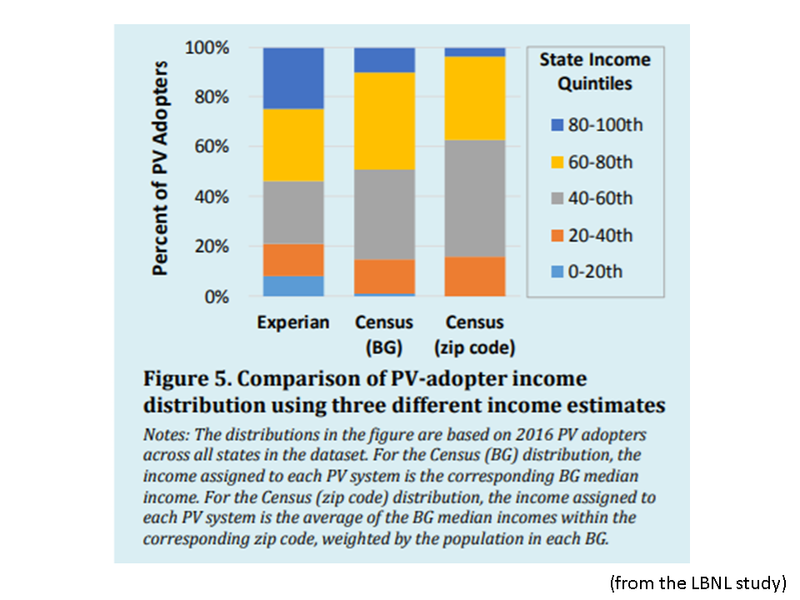 Cross-state differences in PV-adopter income trends, such as the metrics in Figure 3, are driven in part by more-general income variation across states. For example, in states with relatively high incomes (toward the left in the figure), income quintiles are shifted upward in absolute dollar terms; HHs in the bottom three quintiles are thus more likely to be able to afford PV. At the same time, a smaller fraction of the overall population in high-income states falls within Pew’s middle class definition and below 200% of the FPL; the fraction of PV adopters in those income ranges is thus also smaller. The converse is true for states with lower overall income levels (to the right in figure). 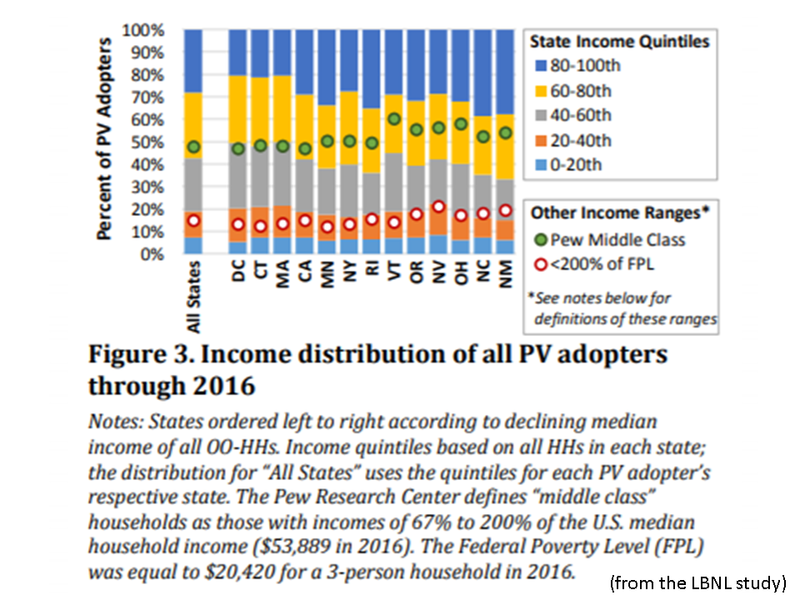 Other cross-state differences in PV-adopter income trends may be driven by policy and market factors, though those issues are outside the scope of the present analysis. PV adoption rates by LMI customers lag behind the broader market, though the disparity is smaller when focusing just on owner-occupied households and recent installations. In aggregate across all states in our sample, roughly 2.2% of all HHs had installed a PV system by the end of 2016, as shown in the left-hand panel of Figure 4. 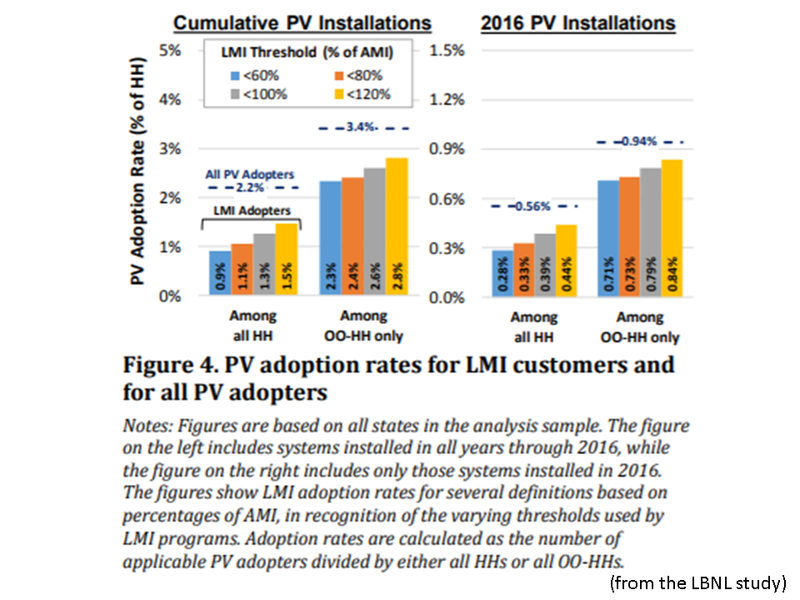 By comparison, cumulative PV adoption rates among LMI households through 2016 range from 0.9%- 1.5%, depending on the AMI threshold used to define LMI (state programs tend to use thresholds ranging anywhere from 60% to 120% of AMI). If focused exclusively on PV adoption among OO-HHs, the gap in adoption rates persists but is appreciably smaller. This is due to the lower rates of home-ownership among LMI customers, and the fact that home-ownership is effectively a precondition for residential rooftop PV. Similarly, the gap in adoption rates is smaller when comparing just annual adoption rates in 2016, given recent trends in PV adoption toward more-moderate income HHs. Using an LMI threshold equal to 100% of AMI, for example, 0.79% of LMI OO-HHs across the full set of states in the sample installed a PV system in 2016, compared to 0.94% of all OO-HHs (i.e., an LMI adoption rate equal to 83% of the statewide adoption rate). Among individual states, the annual adoption rate among LMI OO-HHs in 2016 varied widely, but generally ranged from 70-90% of the corresponding statewide annual adoption rate. In general, this lag in LMI adoption rates is less acute in those states with higher overall incomes, as LMI HHs in those states have higher incomes in absolute dollar terms. LMI PV systems tend to be somewhat smaller and more likely to be third-party owned than non-LMI PV systems. 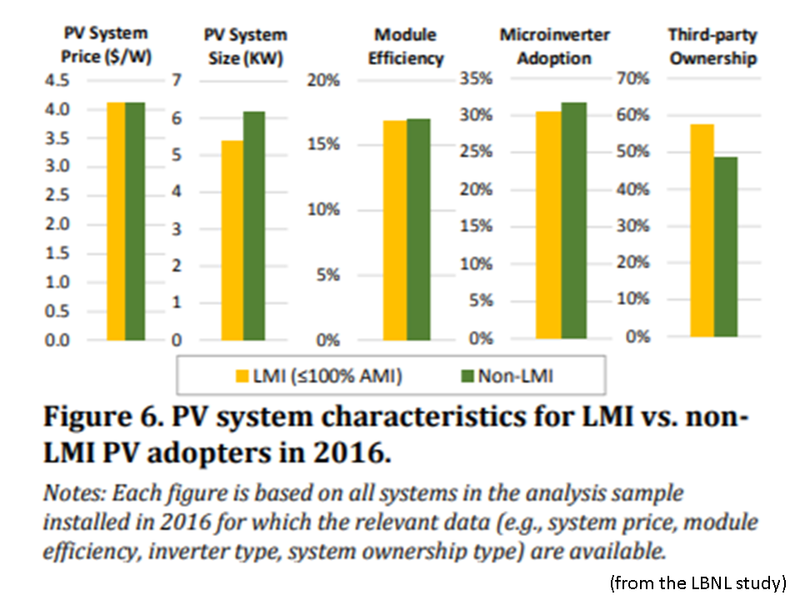 Figure 6 compares PV system characteristics for LMI and non-LMI HHs, based on 2016 installations, and again using an LMI threshold equal to 100% of AMI. Though some of the PV system characteristics exhibit no discernible difference between LMI and non-LMI HHs, two characteristics do show a clear trend. The first is that PV systems for LMI HHs are notably smaller, with a median size of 5.4 kW compared to 6.2 kW for non-LMI HHs. This difference may be attributable to several factors: LMI HHs are more financially constrained and thus opt for smaller, lower-cost systems; LMI HHs may also have smaller roofs and/or less electricity consumption to offset. Given these differences in system size, it is perhaps noteworthy that median system prices are effectively identical between LMI and non-LMI HHs, as one might otherwise expect the smaller systems typical of LMI HHs to be more expensive on a per-watt basis. The other notable contrast in Figure 6 is the higher rate of third-party ownership (TPO) among LMI HHs (57%, compared to 48% for non-LMI HHs). This may reflect greater cash constraints among LMI HHs, fewer alternative financing vehicles, and/or less ability to monetize tax benefits compared to wealthier HHs. It is nonetheless somewhat surprising, given the oft-stated concern that lower-income HHs may have more difficulty qualifying for TPO contracts, given a presumption that these HHs have lower credit scores. • The choice of data and metrics clearly matter. For example, using household-level data, as this study does, avoids the bias associated with block-group or zip-code level income statistics (when applied to PV-adopters), thereby yielding a more-accurate characterization of PV-adopter income trends. Household-level data are also essential for detecting trends among the tails of the income distribution (e.g., for low-income customers). As also demonstrated in this analysis, the basic findings can differ dramatically depending on whether PV adopters are compared simply to all households or, in a more targeted fashion, to just owner-occupied households. Though not possible in this study, future analyses may reveal further differences by comparing just among single-family, owner-occupied households. • Home-ownership is a key driver for differences in PV adoption among income groups. Although the results show that PV adoption has been, and remains, consistently skewed toward higher income households, much of that skew can seemingly be attributed to higher rates of home ownership. These findings reinforce the importance of business models and programs aimed at renters (at least where expanding access to PV among LMI populations is a priority). Research into income trends among community solar subscribers could help to establish whether this particular business model, which enables access by renters, has achieved more-balanced participation across incomes. • PV-adopter incomes are diverse. PV adopters include households across the income spectrum. 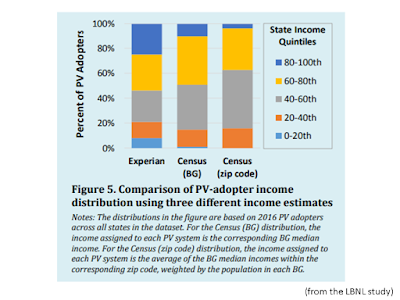 While PV adopters as a whole are higher-income than the population at large, a sizeable portion (the exact percentage depending on the specific metric) are of relatively modest means. Thus, while public and private-sector actors have good cause to ensure equity in PV access across income groups, it should not be overlooked that “moderate-income” or “middle-class” households are already a significant beneficiary of existing solar markets. • The income profile of residential PV adopters is dynamic and evolving. This analysis shows how PV-adopter incomes have changed over time, in different directions and rates depending on the time period and state. This has several broad implications. First, it suggests some value in periodically reassessing PV-adopter income profiles by planners and private firms interested in understanding the demographics of solar adoption. Second, it raises questions about the underlying drivers for recent trends and about how those trends may evolve going forward. This is especially pertinent given the preponderance of recent initiatives and innovations aimed at advancing PV among LMI customers, and the continued evolution in the customer-economics of and financing options for residential PV. • Local and regional factors impact the income characteristics of PV adopters. The study results show substantial differences in PV-adopter income characteristics across the various states in the analysis sample. Much of that variation is ostensibly a function of more-general differences in income levels across states. However, other market and policy drivers likely play a role as well, and those drivers could become more significant in the years ahead as states experiment with different programmatic and business models for advancing PV access and affordability for LMI households.